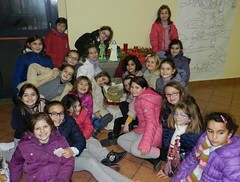 On December 20, 2014, the Servant Sisters of Brignano had a get together with girls ages 7 – 11. We started by playing, warming up a little and doing some ice-breakers to get to know each other. We then went to greet the Lord of the house, Jesus in the Eucharist, to spend some time in prayer. 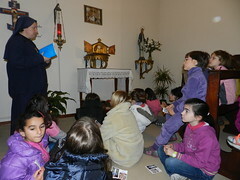 Sister Rocío spoke about Nenolina (Antonietta Meo), a little girl from Rome who died at the young age of 6, but who had a great love for Jesus and Mary. After that moment of prayer, we had a Christmas workshop: a snowman made out of yarn. While doing this craft, the girls were able to exercise a little patience and perseverance. After we finished the craft we ate, since they were very hungry. We then played and watched a movie about the story of Christmas, which helped us to reflect on how to live it the right way. With much happiness, thinking about the coming of Jesus, we sang to Him in front of the manger, when, we realized that ... He was lost! So we got ourselves moving to find Him before Herod would kill him. 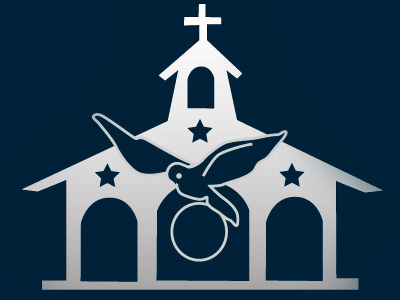 The girls were divided into three teams and before we knew it, they were all over the convent trying to win the clues that would lead them to where the “lost” child Jesus was. Once He appeared, we sang some Christmas carols and finished the workshop, happy because we had found Baby Jesus.